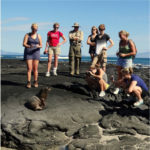 I was delighted when Erynn at Tropic of Candycorn, a wonderful family travel blog, asked me to write a destination post. Of course, I was then faced with the hard decision of picking a place to write about. Having crisscrossed the globe in a number of ways – through study abroad programs, on a shoestring in college, and on Knowmad exploratory trips with Jordan to name a few – I felt like I was venturing into the future writing about a destination through the lens of family travel. Let me explain. Almost a year and a half ago now, I embarked on my biggest adventure yet – that of motherhood. There are no words that can describe it as any mama knows, and as amazing of a ride as it’s been thus far, my travels have become much more localized these days and I’m packing (and repacking) a diaper bag for the most part. Now that we’ve moved onto solid foods and full nights of sleep, however, I’ve got my eye on our next trip….with Trey in tow, of course. This chance to write about a great destination for family travel couldn’t have come at a more perfect time. It really gave me the chance to reflect on all the places I’ve been and envision how a child would see them. I chose to write about The Sacred Valley in Peru – one of my favorite places on earth and one we can’t wait to share with our son. Read the full Sacred Valley of the Inca destination post on the Tropic of Candycorn blog and see our Peru Active Explorer itinerary below, that includes traveling to the Sacred Valley and is perfect for active families. Fly Cusco. 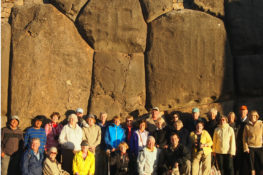 Explore Incan stone terraces at Sacsayhuaman, subterranean altars of Kenko, the water temple Tambo Machay, and Puka Pukara fortress. Continue into snow-capped Andean peaks to your oasis in the Sacred Valley.